WhatsApp was working for many months on a feature that allows to quickly identify new unknown contacts, on WhatsApp for Android. Everytime someone sends you a vCard in a chat, that contains the information of a contact, WhatsApp stores it in order to show you when it’s necessary. You need to update your WhatsApp version to the 2.18.111 Android beta update on Google Play Store, in order to remotely receive the activation of this feature. Precedent versions might get the feature, but it’s very recommended to update to this latest update. 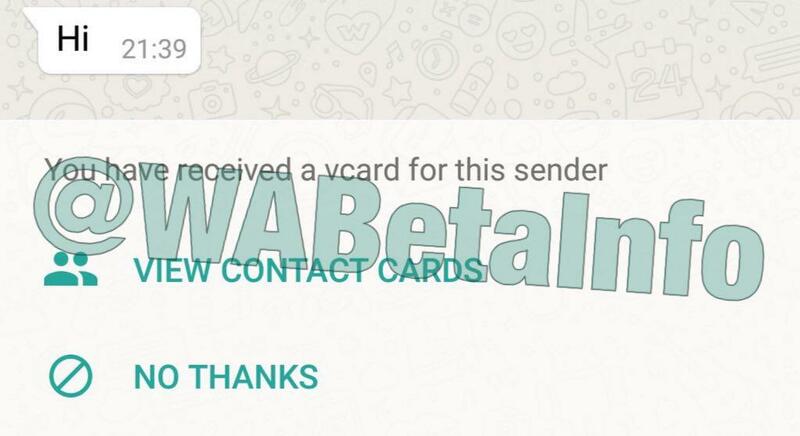 Since today, WhatsApp is rolling out for all WhatsApp beta for Android users the possibility to use the advantages of the new vcards indexing feature. In particular, thanks to these improvements, when a new unknown contact send you a message, if you have already received its contact card from somebody else, WhatsApp will immediately show you an alert in the unknown chat, asking if you want to view the vCard (in order to quickly save it, adding the contact in your Address book) or if you want to discard it, if you’re not interested. WhatsApp beta for Android 2.18.111 finally fixes the issue that many beta users were experiencing. In particular, this issue replaced the first letter of words YESTERDAY and TODAY with the relative ASCII code. This happened in all languages. This new WhatsApp beta for Android 2.18.111 has another bad issue.. everything is in English, except YESTERDAY and TODAY. So, if you’re an english beta user, you can correctly update, but if you use WhatsApp in another language, consider to wait the next beta. Previous PostPrevious Instagram to support Q&A sticker!